Phi Node, for code in SSA form. Each Phi node has an array of possible values that it can take, depending on where control flow comes from. Definition at line 1291 of file ThreadSafetyTIL.h. Definition at line 1293 of file ThreadSafetyTIL.h. Definition at line 1298 of file ThreadSafetyTIL.h. Definition at line 1304 of file ThreadSafetyTIL.h. Definition at line 1305 of file ThreadSafetyTIL.h. Definition at line 1306 of file ThreadSafetyTIL.h. Return the clang declaration of the variable for this Phi node, if any. Definition at line 1317 of file ThreadSafetyTIL.h. Definition at line 1308 of file ThreadSafetyTIL.h. Definition at line 1333 of file ThreadSafetyTIL.h. Set the clang variable associated with this Phi node. Definition at line 1320 of file ThreadSafetyTIL.h. Definition at line 1314 of file ThreadSafetyTIL.h. Definition at line 1313 of file ThreadSafetyTIL.h. 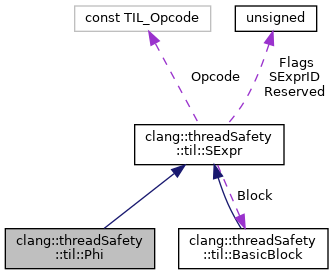 Referenced by clang::threadSafety::til::PrettyPrinter< StdPrinter, std::ostream >::printPhi(), and clang::threadSafety::til::simplifyIncompleteArg(). Definition at line 1323 of file ThreadSafetyTIL.h. Definition at line 1310 of file ThreadSafetyTIL.h. Definition at line 1311 of file ThreadSafetyTIL.h.